It usually consists of two performers in traditional garb engaging in witty banter. Throughout cross talk’s history, aspiring comedians from poor families studied under a master for three years and performed with the teacher for one season before striking out on their own. Mr. Guo Degang studied cross talk at age 7 and never finished junior high school. In 1995, he left his hometown of Tianjin to open his first club in Beijing. The rejuvenated entertainment form has been promoted by the government, but comedians sometimes use it to throw barbs at Chinese politics and society. Mr. Guo, 37, skewers the police, bureaucrats and celebrities. It could have been a scene out of a Chinese version of ‘The Godfather,’ but Mr. Guo is a comedian, one who, with his antics, has launched a revival of a traditional Chinese form of performance comedy called cross talk. Mr. Guo has attracted young and middle aged audience members to the aging cross talk crowd. In recent years, he has opened two more restaurant clubs and has appeared in blockbuster Chinese movies. From his cross talk shows, his income last year was estimated to exceed 20 million renminbi (US$ 3 million dollars). But masters like Ding Guangquan, 76, who has appeared on China Central Television’s Lunar New Year gala, see cross talk marginalized by political controls. Other cross talk elders say the money associated with the form’s popularity has commercialized the shows, neutralizing the traditional wit. During the Cultural Revolution, cross talk was used as a propaganda tool. Afterward, a brief period of openness was quickly quashed. 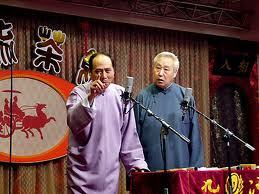 Cross talk topics as innocuous as Beijing’s notoriously congested traffic are forbidden on TV radio and the web. China Central Television used a government campaign intended to stamp out vulgarity in the entertainment industry to highlight some of Mr. Guo’s more lewd jokes. His clubs were temporarily closed and his books and CDs taken from bookstores. Chinese people’s access to more outspoken forms of entertainment may one day relegate cross talk to an obscure folk art.